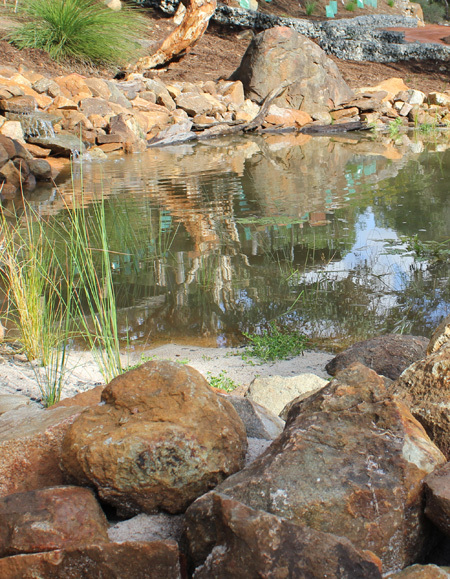 Our focus is on designing and then building your ideal residential garden or small commercial landscape or natural water feature. We strive to meet your needs and increase the value of your property through innovative design and construction solutions. Our business ethic is to use local, natural and recycled products wherever possible so we often have a high proportion of elements like natural limestone, rocks, water, timber decking and compacted gravel in our gardens. Our gardens are also very plant-focussed using a wide variety of suitable native and exotic plants to create gardens with a lot of visual interest and seasonal change. You will benefit from our experience working in gardens of all sizes from tiny courtyards to acreage. We've also designed and built a wide range of styles of gardens from contemporary to cottage to natural gardens. Our mission is to make the process of having your new garden designed and built simple, enjoyable and rewarding! Just click on the links in the services line near the top of this page for more details of how we can help you make your property all that you want it to be and more!